a gracious lady showing the love of Christ with her smile. Thanks so much for having me here, Mary. It’s always a joy to revisit my writing journey as it stays fresh and is always humbling to think how God led me to this place. I’ve written stories – historical fiction only – since I was seven years old. I think I came into the world hardwired to write. I didn’t study craft books and only took one creative writing course in college (which I hated). I think my best teachers were books. I read voraciously as a child and young adult, especially historical fiction or biographies of famous historical figures. When I was working as a teacher and social worker and even as a college student I would carry around legal pads and pens and write my heart out in spare moments. Aside from my family and the Lord, writing was and is my greatest joy and blessing. Until I was in my 30’s I simply wrote for myself, never dreaming or thinking of publication. Then one day my pastor brother challenged me, telling me I’d been given a gift to share and should stop being a closet writer. He actually arranged for my family to help pay for a freelance editor to read my first novel, The Frontiersman’s Daughter. At the same time I submitted to Writer’s Edge. In about six months Revell Publishing perused my manuscript and picked it up. **Mary here, this should encourage many who have been leery about submitting to Writer's Edge. I was so ignorant of the CBA and their standards as I’d read very little in the inspirational market. I didn’t have an agent or an online presence and I hadn’t been to any writing conferences, etc. But the Lord had a plan. I’m always amazed that authors come to publishing in such unique, individually tailored ways. God is so creative in how He leads us and opens and closes doors. 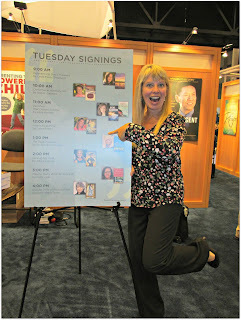 When I received my first three-book contract, I was amazed (and still am!) that the Lord took the writing dreams of a little Kentucky girl and made them a reality. Now, six years and five books later, I can honestly say that publishing has been something of a spiritual boot camp for me. I’ve had to let go and trust the Lord in fresh, often frightening ways. But I’ve found that He’s always faithful, always trustworthy. I was born and raised in Kentucky and my heart has always been in Berea, Madison County, the place my family has resided since the 18th-century. I came to know Christ there at the age of 12, was baptized, and spent my childhood roaming through the woods and swimming in the rivers of my books. and become a follower of this site if you aren't already. Thank you, Laura, for Joining us This Weekend! Choose one and add your comment. I was one of those historical readers too. There was a section in our elementary library with biographical fiction. It didn't have kids going back in time (which I found fakey) it just had the story in kid language. I think I read every book our library had in that section. When anyone enjoys a certain type of book, the reading bug hits. That is good. So, Maxie, what kind of book did you enjoy reading as a kid? Interesting how God works and that your brother pastor would recognize your writing talent. Thank you for the giveaway, I read the first book in the series and am eager to read Love's Awakening. Hi J. Grace, so nice to have you back. I have heard others say they did not see the gift God had given them. Rather someone else had to point it out to them first. Could it be that the gift comes so natural that we don't even realize we are doing whatever it is well? Blessings on the drawing, my friend. Mary and Maxie - Good morning! I'm getting my kids out the door to school this morning and am finally here west coast time :). Wonderful to wake up to your great comments! Mary, Thank you for such a gracious welcome and introduction. I remember you having that gracious spirit and are/were so easy to be with. I love your gentle smile! I find it so interesting that you read historicals but now you write contemporary! I imagine you would be good at both. Maxie, You're so right in saying a lot of young people aren't interested in history. I've thought a lot about this and maybe one of the reasons is the dry way it's being taught. Sometimes I think students should read historical novels, at least clean ones, to learn about history. You have a wise heart - love when you say He didn't say things like publishing would be easy but that He guarantees to see us through it. Thank you for your comments. I'd love to send a book your way! Dear J. Grace, So good to meet you here. I really am blessed to have a brother who feels our gifts should be shared and not hoarded, so to speak. I don't think I would have ever published anything if not for him. Writing to me was just joy enough. So thank you again, Chris, if you're reading this! I'm so happy you've already met Eden and Silas in the first book and want to meet Ellie and Jack. So you are bringing cookies, Laura? Ooo, love that quote by Beth Moore!! That's fabulous. It's true...we'll never "get there" if our goal is simply material things or achievements. Doing what God asks of us isn't easy and a lot of times, it breaks us...and changes us. Love Laura and her books! So gracious, and it's so encouraging to hear more about her writing journey. There ARE far easier ways to exist. But who wants an existence? I want to cling to the wrought iron gates of heaven and squeal "But I wasn't finished that edit!!" Sometimes it isn't the training that gets the climber up the hill, it's the sheer desire to scale the mountain. SOOOOOO looking forward to this book! Her books are just wonderful to read! Would love to win this book! Thanks. I think I've read most every one of Laura's books including "Love's Reckoning". It was inspirational to read how she was challenged to become proactive and publish her writing. I do believe God uses the writings of our Christian authors to speak to believers as well as unbelievers. Thanks for this opportunity to win her new book "Love's Awakening". What a delight to read Laura's wiriting journey. I am so glad her brother challenged her to share her writing and she accepted that challenge. I've enjoyed several of Laura's books and look forward to reading this one too. I just recently finished The Colonel's Lady, loved it! I have the first book of this new series but have not read it yet. Would love to win the 2nd and be able to read them one right after the other. I think all writers probably love to read... I think the more you read, the more you will recognize good writing. I think it was so neat that her brother encouraged her writing journey! Lindsay, Bless you for being here on this busy Friday! That sure blesses me :). Isn't that Beth quote amazing? I have a little book where I keep her quotes from her Bible studies I've done. They're really encouraging as I journey on. I sure wish I could be with you next week at ACFW. Lord willing, next year. I'll be thinking of you and praying for you and others as you go! Good morning, dear Amy! So glad we're kindred historical lovers :) I can't get enough of it and thankfully there are so many good ones coming out each month. Thanks for being here today - would love to send a book your way! Have a wonderful weekend. I just love Laura Frantz and would love to win this book! Thank you for the opportunity to win! Jennifer, You always draw the richest, most vivid word pictures! You don't even have to sign your name and I'd know it was you :) Love that clinging to the wrought iron gates, lol. Oh, I. Cannot. Wait. for you to meet Jack! But first we must get thee to ACFW, which I am already sorely missing. Here's to next year!! Well said, Rosanne! It is really interesting the way things played out, especially since I was and remain mostly a reader of the secular market, at least the clean fiction and plenty of nonfiction. So thankful you like my books! That encourages me in so many ways. Thanks for stopping and wanting to read! I would live to win this book! Melissa, Oh, bless you for your gracious spirit this morning! So happy you want to meet Ellie and Jack :) Jack is the first un-heroic hero I've ever created as he's such a rascal - but someone just left a comment on my Facebook author page that said she can't stand to give Jack up, lol. I hope you'll find him wonderfully redeemable, too. Thanks so much for being in the drawing! So looking forward to seeing you at the conference and the MBT party. Your comment is so spot on. Anything done for simple material or earthly achievement will all fade. But can you imagine the smile we'll get from God when we see Him face to face when He mentions the things we did for Him. sigh. I can't wait. Susan, So good to see you here. You're so right when you say God uses our books to speak and be a light to both believers and non-believers. Well said, thank you. Often we don't know how our words minister to others but He sure does! And I'm very thankful we can play a small part in that bigger plan. Would love for you to meet Ellie and her Jack. Bless you for being here this Friday! Julianna, Oh, I LOVE hearing about your own writing journey! So thankful you have a sis and English teacher in your corner. The Lord really must be up to something! When I look back I can see all these little things that fell into place for me from a very early age with my writing. I am sure you will do the same or are already recognizing it based on what you've shared here. It's thrilling to see that unfold! Bless you for being here! My favorite books to read at night is inspiration. Isn't it just peaceful? And when it's historical, we kinda have a peek into pieces of the story which make the read extra fun. I'm so glad you joined our chat today! Carrie, So good to see you:) I'm anticipating your own release with great joy even though I've already read it with pleasure! Yes, I'm really thankful for my brother, Chris. The funny thing is he took that chance and prodded me even when he hadn't read any of my own writing. He did, of course, read my debut novel after it was published. I owe him so much. And am thankful the Lord prodded him to help me along. Patty, Welcome here! I'm really tickled you've met Roxanna and the colonel:) That book was such a joy to write - and am thrilled you enjoyed reading it! Love when you say you'd like to read the Ballantyne books back to back. That really does make for a richer reading experience. You're the best kind of reader! Thanks so much for stopping here and for the gift of your gracious words. Thrilled to meet you here:) Thanks for wanting to spend time with my Ballantynes! Sometimes the books outside the box are the most intriguing. And meaningful. I'm so glad you joined us today! Thanks for becoming a follower. Stay and catch a few more sun rays. I'm about to serve up some virtual tea. Welcome! So glad you came! Sounds like others agree with you about Jack and Ellie. Hope you can stay for a while and chat with the others. I can't agree with you more, Susan. The inspirational books are for encouragement for all readers. These books embed wonderful deep truths for the believers and eye opening truths for the unbeliever. Woven into a beautiful fabric of story, well the result is pure joy. So great to see you here this week! How is the music program coming along? I imagine your sister is also encouraging you for your music. Imagine that...the tools you are learning in the one can easily be applied to the other. Girl, you have the tools for some awesome creativity. Thanks for stopping by today. Hope to see you again. How are you feeling? Wow, thanks so much for joining our chat on a sunny deck today. Those brothers of ours...what would we do without them? They are teasers and encouragers all wrapped up in one package. This is one of my fav authors and a fellow Kentuckian so I am honored to say hello and welcome to all here learning about Laura. I love love love Laura's books!! Thanks for the giveaway! And yes, I guess writers should love to read. I noticed my daughter who is currently studying to be a choral conductor loves to listen to choral music (and Lady Gaga - the balance?) I find that the more I read, the more I love to read. Now there is a good principle to spin off: I suppose the more I follow God's will, the more I will like to follow His will. Sure loved chatting with you today. Looking forward to seeing you again. Thank you for becoming a follower. I'm so glad you stopped by to join our chat on a sunny deck. Laura has been a great guest speaker. I sure hope you can stay around to chat some more. Looking forward to you joining us again. Welcome back! We saved a seat for you knowing you would arrive when you had a free moment. Blessings on the book drawing. Dear Paula, My kindred Kentucky spirit :) So blessed to see you again. Thank you for including me among your favorite authors. That's really an honor. You ARE an avid reader and I'd love to add this one to your stack! I appreciate your thoughts and prayers as this book is releasing. Candice, Thrilled to see you this morning! Thanks for the warm words - I'd love to send a book your way! Blessings on the book drawing and looking forward to the next time you can stop by. I think it enriches us all to read and read and read, as long as we are discerning about what we are reading. Laura, been waiting a long time for this next book and would love to win a copy. Thanks! I love this comment by Beth Moore! I'm going to write it on one of my favorite bookmarks as a reminder. I get so frustrated sometimes with certain aspects of this season of my life, and this statement helps give it perspective. Laura Frantz has been my favorite author since I first read Courting Morrow Little, and went on a frenzy to find every other book she'd written! I just can't wait to read what happens next where Love's Reckoning leaves off. Thanks Laura! Welcome and thanks for becoming a follower. I'm so excited you've joined the gang here. To tell an author you have been waiting a long tine for their next book is to render one of the highest compliments, because when we are waiting--five minutes can seem like a year. She read and read and read. Reading is a great teacher, and can be a healer. I have found much wisdom in the Christian fiction I read. Thank you to all the wonderful writers who share their talent with us. I just started following this blog. Thank you for joining our chat today. Laura's book will be a wonderful, sweet read. Candice, thanks for stopping by and joining our chat today. We've had a great time getting to know you. I sure hope you can come back again. What sweet words. I'm so glad you came today. I like your idea of writing Beth's quote on a favorite bookmark for a reminder. And on this sunny day, sitting here on the virtual deck with the others I hope you feel the warmth God has given us today. Thanks so much for joining us. I can't wait for your next visit. I totally agree that reading is a great teacher, and can be a healer. It gives us the opportunity to consume information at our own pace. Even though I am a writer I still tend to be a word by word reader instead of a scanner. I love the visual images painted on the story canvass and then watch the characters move about, captivated by their issues and then finding at long last the solutions waiting for them. Thanks so much for joining us today. I sure look forward to your next visit. These are great questions. I have found some the the answers to your questions in other inspy historical fiction books. It's amazing to learn about the clothes, the requirements when and where...can you imagine the cost if we had to do all of that today? The shoes are so beautiful but I don't think I could wear some of the hat's I've seen. Let's stay tuned for Laura's comment back to you to see if she gives us a clue. Like you, when I look at those lovely pins I long to know more - who the wearer was, why the gown was made, where it ended up, etc. Thanks so much for stopping. You've made my day! Kd! Love seeing you here, there, or anywhere :) Thrilled you want to enter for this next book. A year truly is a long time to wait. I so wish I could hand reading friends a book a month! That's my wish for my most anticipated books. 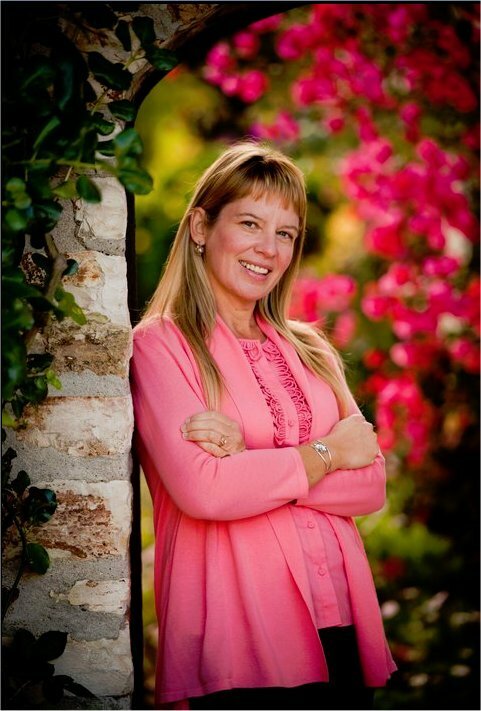 Laura Frantz is one of my favorite authors!!! Angela, I'm so glad this Beth quote speaks to you as it does me. Great idea to 'bookmark it' to keep close. And I'm absolutely thrilled you've met Morrow! And that she led me to you. God is so good! I hope you enjoy Jack and Ellie just as much. Though Morrow and her world make for a very different kind of read, I think! Nichole, So thrilled you're here and that my books are among your favorites! Thanks for your kind words. Hope you have a wonderful weekend. Already a follower. Would love to read. I used to feel God used me for over 44 plus years. Now he has nothing for me. Alli, LOVE that you've met Lael! That makes me smile. I'm so, so glad you want to read on :) How I'd love for you to meet Eden and Silas and Ellie and Jack. Thanks so much for stopping here, jrs. I understand your thoughts. There have been seasons of my life where I felt God was silent and had forgotten me or was no longer using me. Your 44 years of faithful service is certainly an amazing thing! Sometimes I think He gives us periods of rest even when we'd rather not. My mom, retired now, feels much the same way. Thank you for wanting to read my book! Thoughts and prayers with you. I feel so blessed that you joined us today. 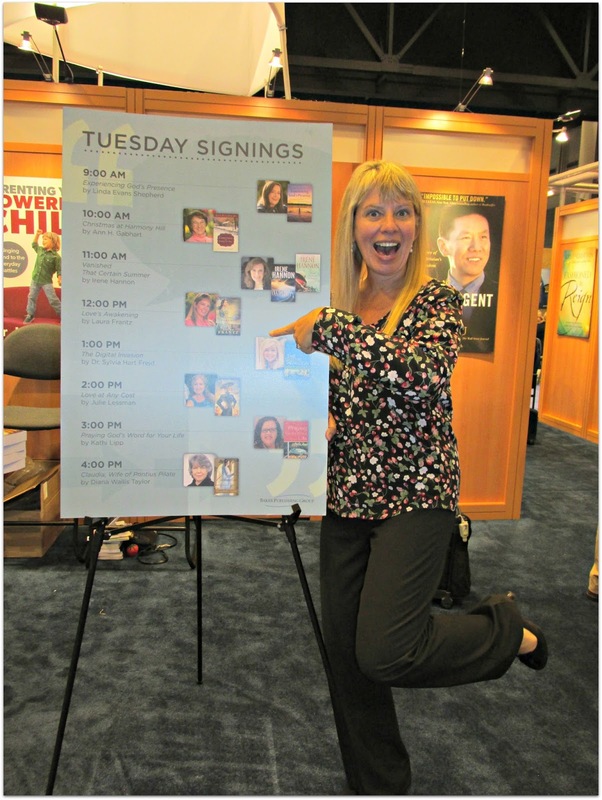 Your excitement and spirit raised the enthusiasm for Laura's books. Thank you for becoming a follower. I sure look forward to seeing you again. Maybe He'd say "All right, let go of the gates...I have a corner of Heaven with a desk and an iPod and an angel standing by to massage your shoulders...AFTER we go meet a few people. And, did you forget we're having a banquet? That got your attention, didn't it? hat's right, I speak your love language...chocolate. And that meme on Pinterest is right, it totally IS a fruit! So, take my hand and we'll go...take my hand, let go of the gate...let...go...of...the...GATE." Jane, nice to see you here on this sunny day. Yah, know, I do look forward to your visits. You truly are a special person, one who brightens my day. Sometimes the work God has for us is to meditate, read His word, and enjoy His creation. Did you know Hudson Taylor had to come home from China for about 4 years. Yep. It was due to health. He felt rather bad about "leaving the ministry" until 4 years later we he realized, the new missionaries sent, the books he'd written in the time, the prayer he'd done, the mission he established for inland China would not have happened had he not come home for that time? God has something for you girlfriend. He loves you more than anyone else in the world can. It's been very nice to get a glimpse into the way God's directed your path, Laura. Blessings, always, as you continue on in His ways. Karlene, Thanks so much for stopping and saying such gracious things. God is so amazing in how He leads us. I'm so thankful. I hope you like my books if you read them. I'm happy to include you in the drawing! Don't enter me in the drawing, since I have just started reading Love's Awakening. I've read and loved all of Laura's books, and I never get tired of reading her writing journey story. She's been an inspiration and encouragement to me for years now. Just dropping in to say "Hey" Laura and good to meet you, Mary Vee! I have read every one of Laura's book so far except this new one. They are great! I loved this interview and I think it is neat that you only took one creative writing course. You are truly blessed with great talent!! What a treat to have join our chat about Laura's book today. I was hoping you would come. I am the honored and blessed one. To have Laura as my guest and you joining the chat. What an blessing to hear you say Laura's books have inspired and encouraged you, especially for years. This tell so much to others who will also benefit from Laura's stories. I look forward to the next time you come. I agree, Sheri. Laura's books have shown real talent and as a result have touched many hearts. I'm so glad you have been able to read them. Thanks for joining us today and sharing with us. Thanks so much for joining us today. I sure loved visiting with you and hope to see you again, soon. Thank you for becoming a follower and blessings on the book drawing! Hi, Alli and welcome to our chat with Laura. So happy you've been enjoying this series by Laura. Interesting how God works! So glad her brother was persistent or we would missed some great reading. She's a wonderful author. Thank you for the chance to win her book. Waving and hugs to Lori! Likewise, you are a great encouragement and blessing to me. And now we can add Mary to the mix :) Bless you both for such a good Friday! Dear Sheri, Huge thanks to you for taking time and reading all my books! I hope you enjoy Ellie's story just as much. Readers like you make my work so worthwhile. God bless you! Connie, I would love for you to win it:) Thanks so much for joining in! Barbara, Bless you for your gracious spirit - so thankful you enjoy my stories. You make me very glad of my brother's prodding:) Hope you have a wonderful weekend! Exciting, isn't it Barbara? And to think, God does the same for us for the tasks He wants us to do. God is good...all the time. So nice seeing you today, Barbara. Blessings on the drawing. So glad you came to our chat today! One of the few books that I'll actually spend money to buy is this one. :) So excited to read this when I get the time!! I SO enjoyed your interview/testimony, & am over-joyed at meeting an author who is a native Kentucky resident! I live in the Louisville area, & absolutely love the history & crafts of the Berea area. Your testimony is SO inspiring, & I love the Beth Moore quote (just love HER, anyway). Your journey to publication is an example of the Lord "working in mysterious ways, His wonders to perform". 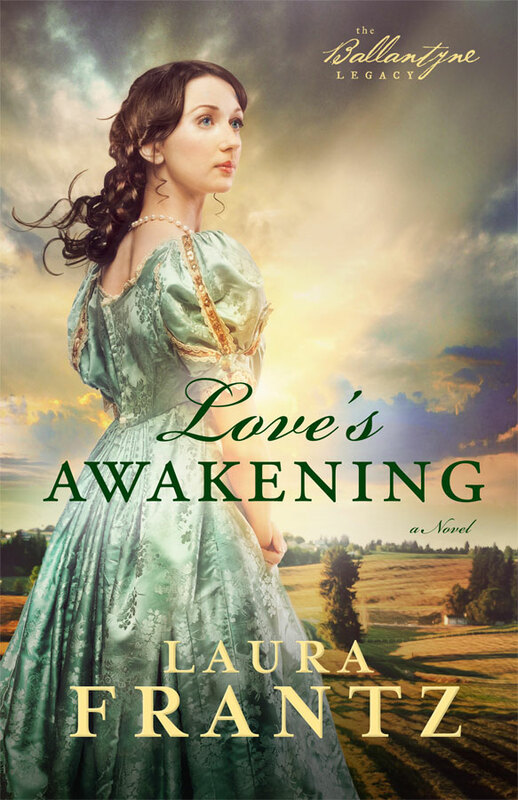 I haven't read any of your books, & would love to read Love's Awakening - thanks for the opportunity to win a copy! Hi! So nice to see you. Thanks for coming to our chat. If you can come back to add another comment, can you tell me why this book is so special. I mean, I will only spend money on certain books and my reasons are very specific. What is special about this book that is calling you to read it? Welcome back. So glad you could join us even in the wee hours of the night. Love's Awakening will be a wonderful read. Whether you win the book or not (an I hope you do) I hope you will get copy and enjoy this delightful story. I love Laura's books! I can't put them down once I start reading them! Can't wait for her new book! I've read all of Laura's other books and I loved them!! Her writing is so unique and I can read it so quick! The endings are also unpredictable, I think. Thanks for joining us, Lisa. Sure loved having you here. Bonnie, So thrilled to meet another native Kentuckian! Seems like we have quite a bit in common given our love of home, Beth Moore, and reading:). I'd love for you to read my books. Thanks so much for being in the giveaway! Waving at dear Lisa! So thrilled you want to meet Ellie and Jack:) You're in the hat for the drawing! Hi Laura and Mary, I was in facebook on another author's open chat room and there was Laura's.name that that popped up and i pushed it what a God send that was! I have totally loved Laura's. Notication's site, Laura takes so much much of Her time out to write and keep up with her reader's! I always have what she writes, Laura is so humle, loving and carin;g Christian woman, ,I have have become such huge fan reader of hers! I just bought and received 3 of Laura's books yesterday, I can't wait to start to reading them, talk about Laura's books, Her books covers are the most beautiful and classy of all my books! I am a avid reader so that is a huge stament of her books and their contents! I am so impressed of her bio and iher testimony, a , how much she read as a child and they were all history books! How awesome that is, I was a avid reader also a also but of bio s! My Dad used to catch me reading with a flasihlight lol wow, was that was a God calling you to be an author and sending s message from God from your writings in your books! You will definitely send God's message thru your books! I really enjoyed your bio, I just wanted you to know that ! I thought ordered all your books but when were shipped only received 3 books. Frontier's daughter, The colonel's daughter And Love's Reckoning..I am broke now as I ordered other. Books so I would love to win your book epecially signed! Wow, what an honor,! Thank you for this contest and i also became a member of this wonderful site ! Your brother was a God because if your ordained pastor brother of his pushing you to be an author and getting you out of the closet! Do you know how many people you have blessed by writing and publishing your books? ! Thank you Laura with all my heart, God bless Laura and this site for working so hard to help readers, I would love to win the book! Sorry for the typos, I need new glasses, her brother was a God Send to push Laura into publishimg Her books! This took me and a hour to correct the typos and there Are still typos, the box wouldn't move down, I know a dummy but a God loving dummy! Laura's spirit comes through in all her words, whether they are comments with her fans, or the amazing fiction she writes. Every book of her is the best, until the next one comes out! Thanks Mary! I enjoyed the interview and I'd love to be in the drawing for the new release. I'd love to sit with Laura and hear about her travels to Scotland. What I'm hoping is that she is writing fiction set there! Mary, are you going to ACFW? Praise the Lord! I did buy Love's Awakening! ! Please take me out of the drawing as i want someone to win that doesn't have that book! Thank you! Laura and Mary! Laura says she wrote 5 books so I have to figure out which book I don't have now? Sorry for writing such a long repy. It won:t happen again! Very short...I am just very passionate about about Laura's books! I think she is a fantastic writer and most of all her love for Christ! I am so glad you were able to find the books. And I see you were excited, finding a way to get copies quickly. What a joy it has been to get to know you. I am looking forward to our future visits together. I'll see you there, too? Debra! I was just thinking of you the other day as I saw you over at Elaine's blog when she was talking about colonial cleanliness, a very smelly post, lol;) Thrilled to see you here. And thanks once again for being such an encouragement and support. I'd sure love to send a book your way. Darlene, WELCOME here! So happy to see you - and no, I didn't notice the typos as I'm too busy trying to correct my own:). THANK YOU for purchasing LA. I can keep writing because of you! You are such a blessed encouragement to me and I thank the Lord for you each time we meet. Bless you for your generous heart in giving someone else an extra chance of winning. Darlene, Oh my, I missed this reply of yours here but if you move down the comments you'll see my reply to you below. But dear Mary responded and looks like everything is in hand! I am so excited to read this book! I already have it on my TBR list. I wish you great success with your book! Yes, I'm finally getting back to conference after four or five years, because someone blessed me with the cost of registration. And I'll be driving in with my friend Barbara Early all the way from western NY. I can't wait. Looking forward to meeting you Mary! Sharon, Thanks so much for entering the drawing! Glad to put your name in the hat! 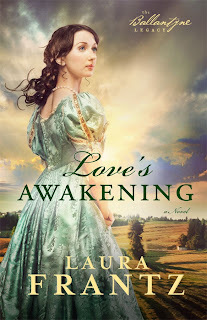 Patricia, Oh, so thrilled Love's Awakening is on your TBR list! I imagine your piney woods in Texas is beautiful this morning! Thanks so much for being in the drawing. Would love to send a book your way! We enjoyed having you here with us today. Thanks also for sharing your well wishes for Laura and her books. Awesome to see you again. We kept your chair by the lakeside and have made virtual fresh sweet tea. Blessing on you and looking forward to your next visit. Awesome. Sounds like God has blessed you and put his blessing on your goings. Looking forward to seeing you, too. A wonderful post thank you. LOVE'S AWAKENING does look like such a great read. Mary, Bless you for being here and for your warm words. I'd love for you to meet Ellie and Jack. Thanks for the entry! Thanks so much for stopping by. Just in time, we were all waiting for you to join us. What a great conversation we've had with Laura as our guest. I sure hope you come back again to join us with other authors. It sounds like even though you are unable to be in college at this time to study your music, God will provide opportunities for you to glorify Him in music. Your sister is truly an inspiration. What a gem she has been for you. How blessed you must feel to know God sent her into your life. Sometimes it is difficult to know what God wants us to do at the specific moment. We feel lost and floundering. It's difficult to see that at that second God simply wants us to do what we are doing, it is the preparation for what He has next. Blessings on you Julianna, I look forward to chatting with you again.